Top Flites RC Corsair is big, beautiful and a monokote covered ARF. Made from balsa and ply and ready for installation of gear, it saves months of construction time. Built-up and sheeted sections finished in flat Monokote film. 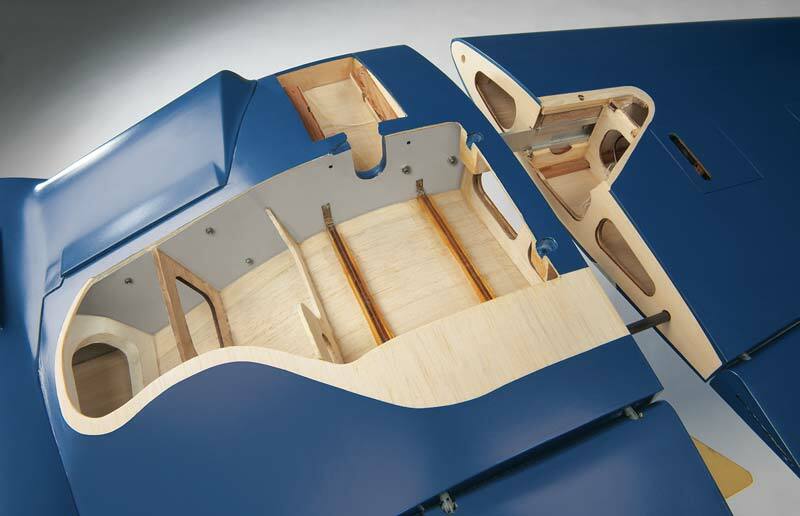 Assembly is simplified with pre-hinged control surfaces. Prebuilt center section with aluminum spar. 3 piece wing panels with simple locking attachment. All control surface hinges are installed. 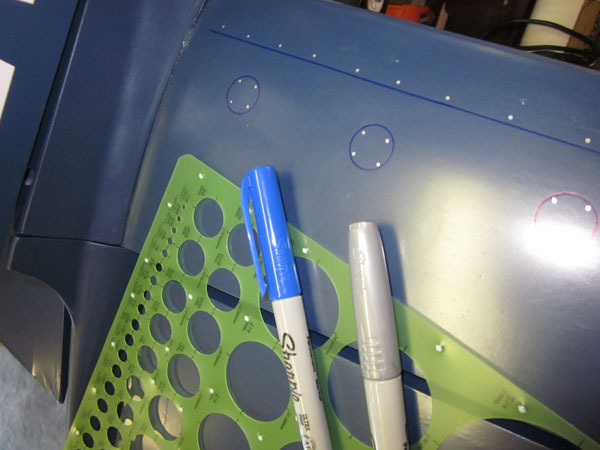 3 separate flaps per wing panel are linked together and require one sevo per panel to actuate. Painted fiberglass cowl and other parts. Work/display stand and a foam work mat. Wing Area: 1376 Sq. in. 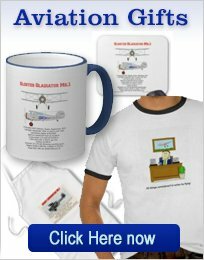 Retracts: Lift and rotate mains and tailwheel. 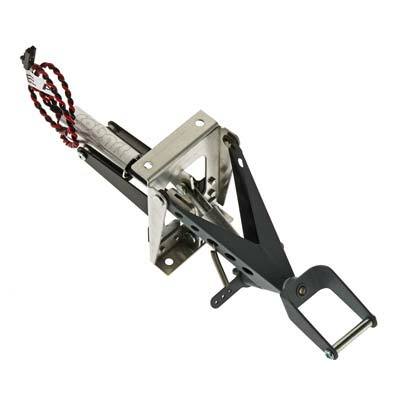 Retracts: Robart pneumatic or electric-see below for more details. This first video is the official Top flite one and shows field assembly procedure as well as some nice flying shots with landing and take-off. Here we see a beautiful model that has been stripped of the Monokote covering and fiberglassed and painted with epoxy paint. Uses a DLE 55 cc engine and several modifications. This is the first flight and the take off is a little scary! I think the extra weight of the finish may effect the flying characteristics, but an excellent job! 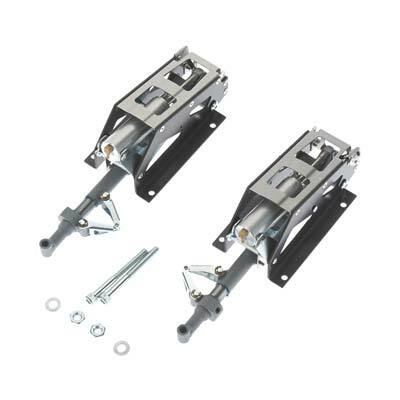 These retracts have been around for a long time and have proven to be ultra reliable when set up as per the instructions. 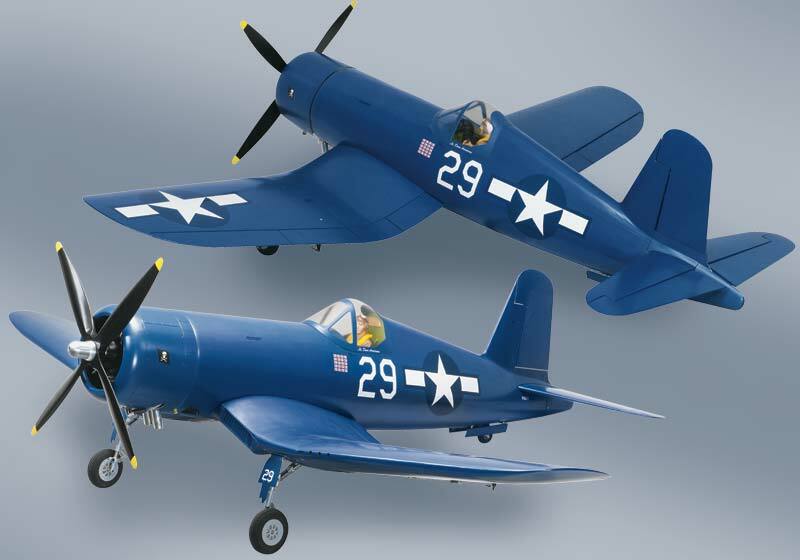 This RC Corsair is designed and built for these units that just drop in. 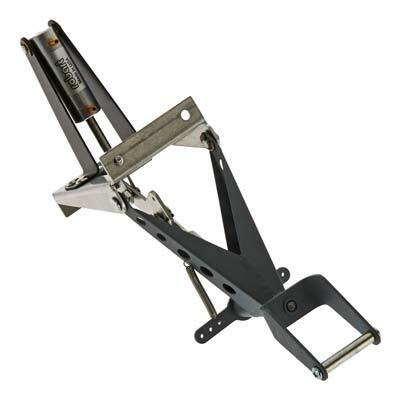 Constructed from aircraft steel and aluminum components. With positive up-locks and 4130 chrome moly steel oleo struts and 1/4" axles. 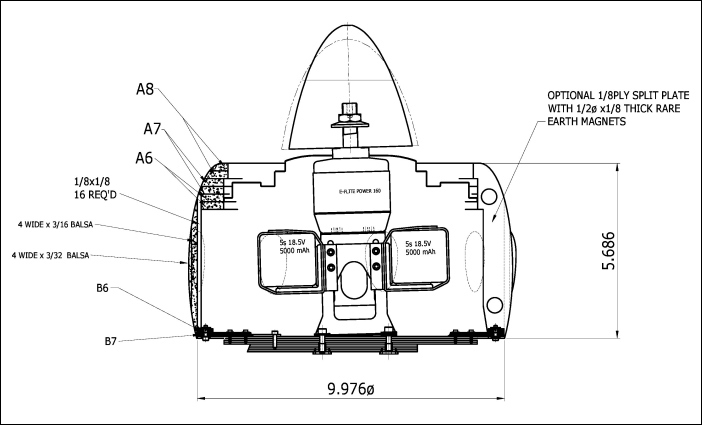 Robart supply a PDF drawing of these units for the RC Corsair. Click here to view. Price=$369.99 Click here to visit the appropriate page on the Tower Hobbies site. Uses a 2" diameter wheel (max) and can be used on models weighing up to 40 lbs. An air cylinder is mounted and just requires mounting and an air line run to it and your all set! A PDF drawing is available. Click here to see. Price=$136.99 Click here to visit the appropriate page on the Tower Hobbies site. 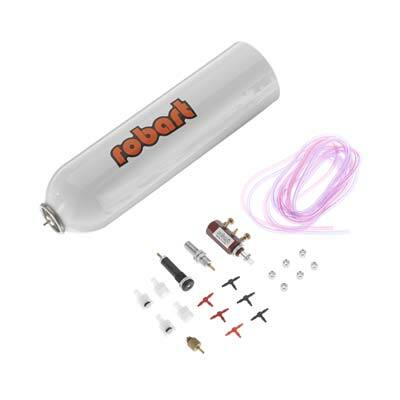 This kit contains all the components required for the air system, except for an air pump that can be used in the field. 12 volt pumps are popular. 5 ft. of red and purple air hose. All the hose fittings necessary. Price=$79.99 Click here to visit the appropriate page on the Tower Hobbies site. Robart are now offering an electric version of the retracts. No more air leak problems! 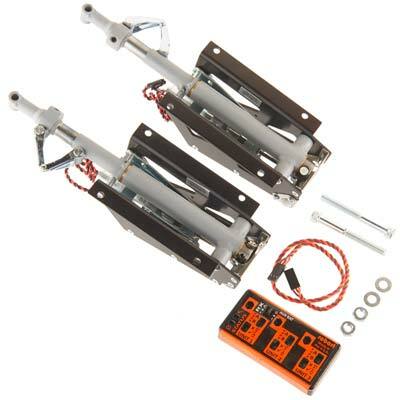 The same reliable mechanics are used and the air cylinders are replaced with electric actuators. The control unit controls 3 actuators and can be configured in many ways. Speed is controlled by the voltage. It can use the receiver battery for power, but I would recommend a separate battery . 4.8-9.0 volt is the range with the higher voltage giving faster retract speed. "Amp-Out" circuitry is used to sense the limits of up down travel. (No limit switches!) This system will also stop the sequence if an obstruction is met. When the amp draw reaches a pre-set limit the motor is completely shut off. If a retract "hangs up", the battery will not be drained. Just use the retract switch, on the transmitter to move the gear away from the obstruction. The instructions are available in a PDF file. Click here to view. Price=$519.99 Click here to visit the appropriate page on the Tower Hobbies site. 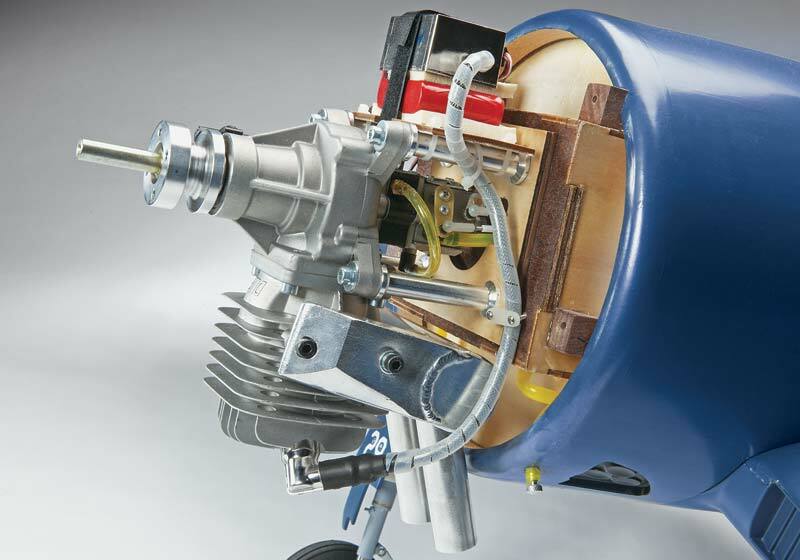 The electric version of the retractable tail wheel is identical to the air driven unit, but the air cylinder is replaced with an electric actuator. Price=$189.95 Click here to visit the appropriate page on the Tower Hobbies site. It is interesting to note that the electric version is $122.97 more expensive than the pneumatic version. 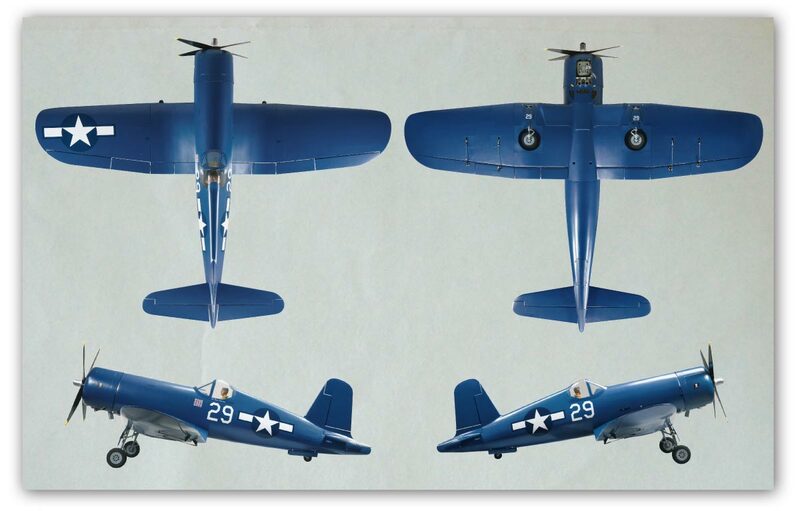 If I were building this RC Corsair, I would seriously consider going electric. With zero chances of an air leak I like the added reliability factor. Keep your eyes open for sales and discounts that can really help with costs! 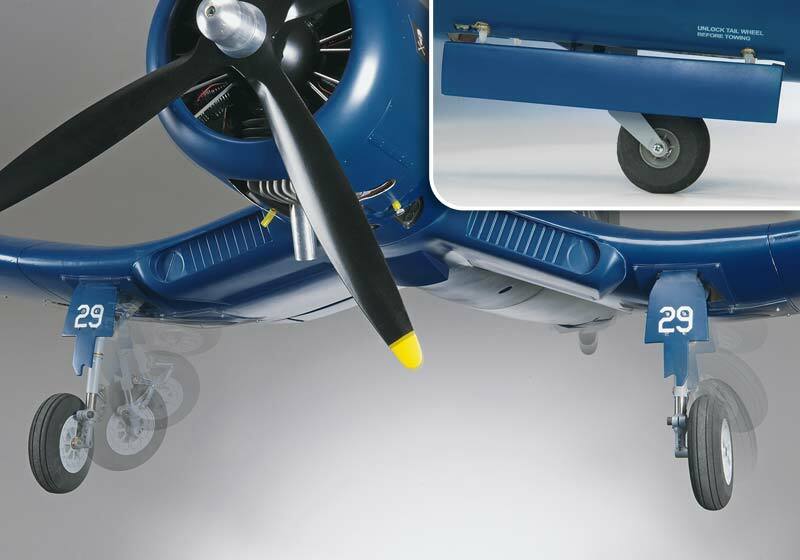 Note that this RC Corsair kit does come with landing gear doors, both for the tail wheel and the main gear. 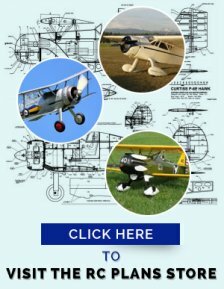 Instructions are given for installation of the tail wheel doors and the main gear doors are provided, but installation is left to the builder. The above video shows the whole operation and you can see the Power HD mini servos that have been installed to operate the main gear doors. Door opening and closing is way to fast but I am sure this can be slowed down! The Spektrum DX 18 transmitter, that the video author uses, has a sequencer that is used to control the operation. 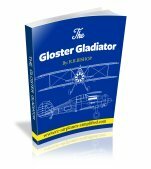 This is the usual first class manual from Top Flite. Excellent English only and tons of photographs take you through the build sequence. Yoy should have no problem at all when building the Gas version. Not a perfect scale outline, but close enough for most of us! 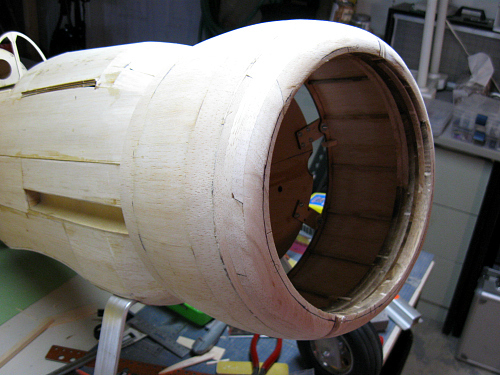 The fixed tail wheel assembly is not scale and the tire is very soft for a model of this size and weight. 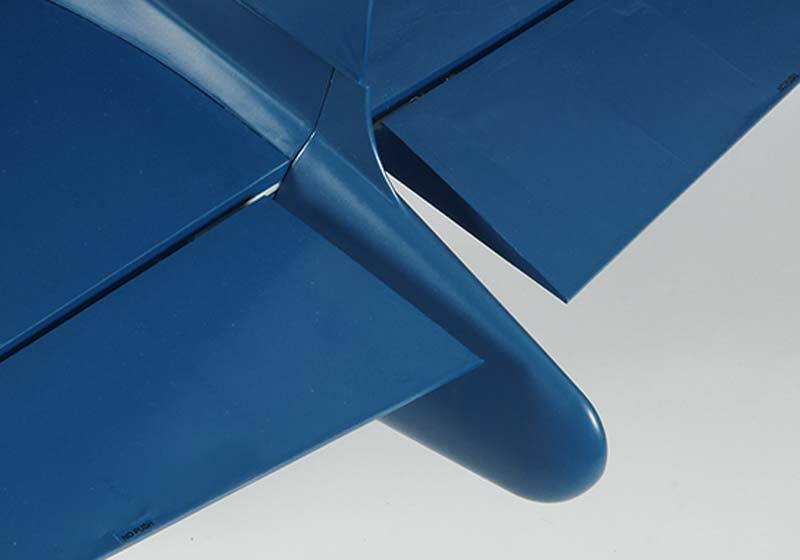 The Monokote covering is prone to "hangar rash"
Adding panel lines and rivets can make your RC Corsair really stand out and can be fairly easy to do. This article by Garry Yarish of the Chesapeake Bay Radio Control Club shows the procedure using Sharpie felt tip pens (Ultra Fine tips). Any mistakes can be wiped away using alcohol but the finish is OK with gasoline residue. The supplied cowl is perfectly OK, but it does have the cooling flaps closed. 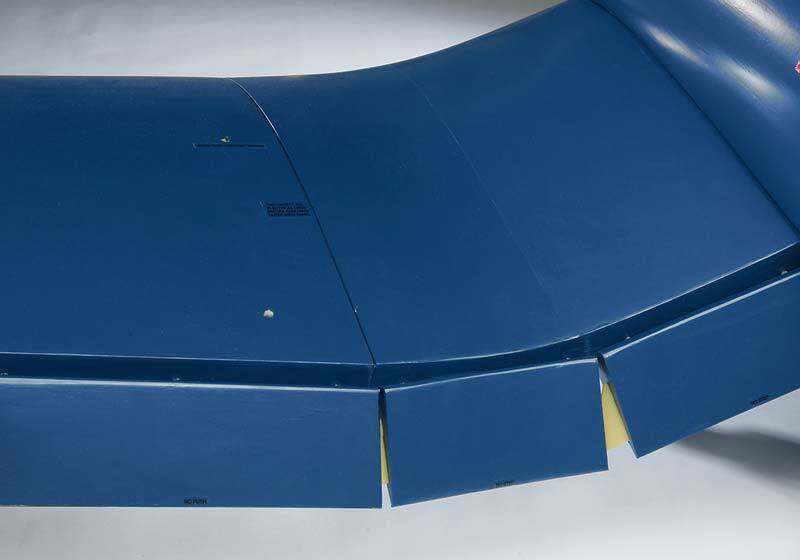 Fiberglass Specialties do offer a cowl with the flaps open. This makes for a cooler engine and may be considered. The cowl is unpainted and thus needs finishing. The model number is TF-20. Click here for more details. 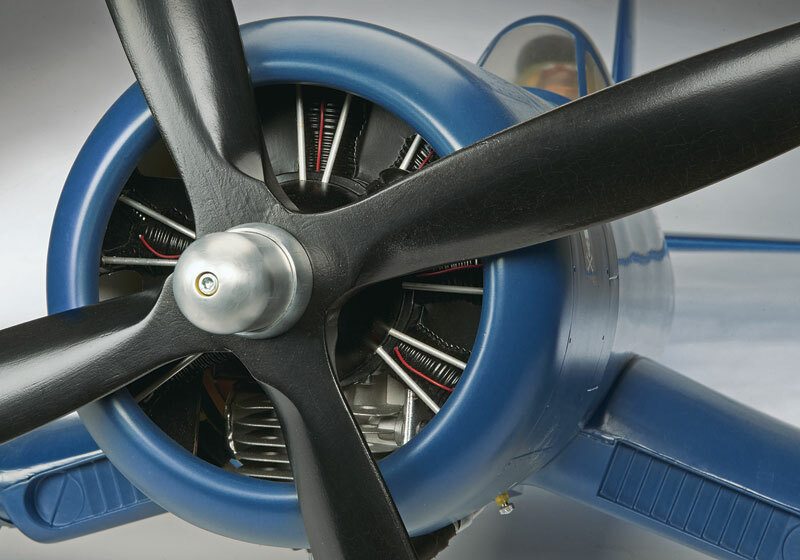 This RC Corsair was not designed for electric power. The main problem is access for lipo battery change. 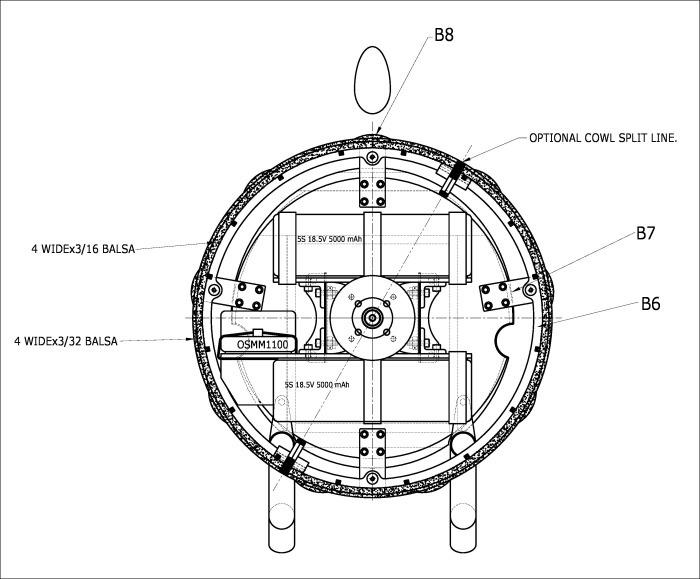 A fuselage side hatch could be added but I would consider this option- Mount the lipos in the radial cowl. I have done this on my 1/5 scale Gloster Gladiator and also split the cowl and used rare earth magnets to hold the cowl in position. Regarding motor and battery selection, I use the Castle Creations Flight Calculator. This saves a lot of time and you can try different combinations of motor,battery and ESC and get a good idea of the models performance. This idea originated with Bob Benjamin. His website has a TON of great building tips. You can visit it by clicking here. 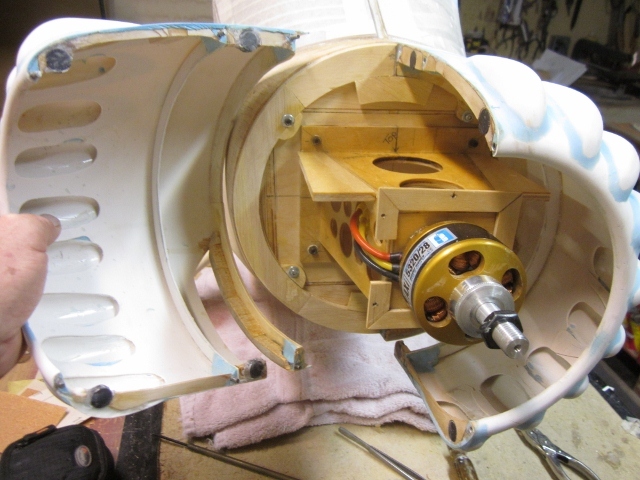 On this page he is building a Top Flite Stinson SR-9, that has a large radial cowl, similar to the RC Corsair. The page shows how to split the cowl and install the rare earth magnets. 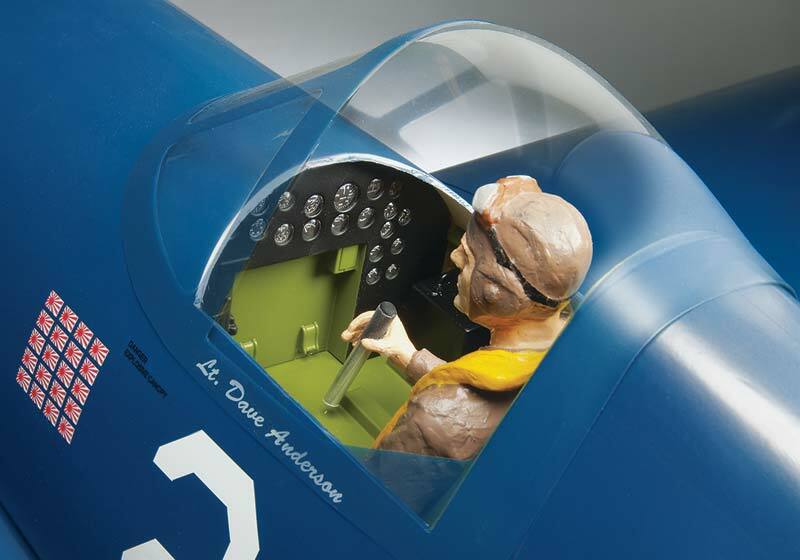 My 1/5 scale Gladiator has a balsa radial cowl, but the principal is the same and can be applied to the RC Corsair fiberglass cowl. 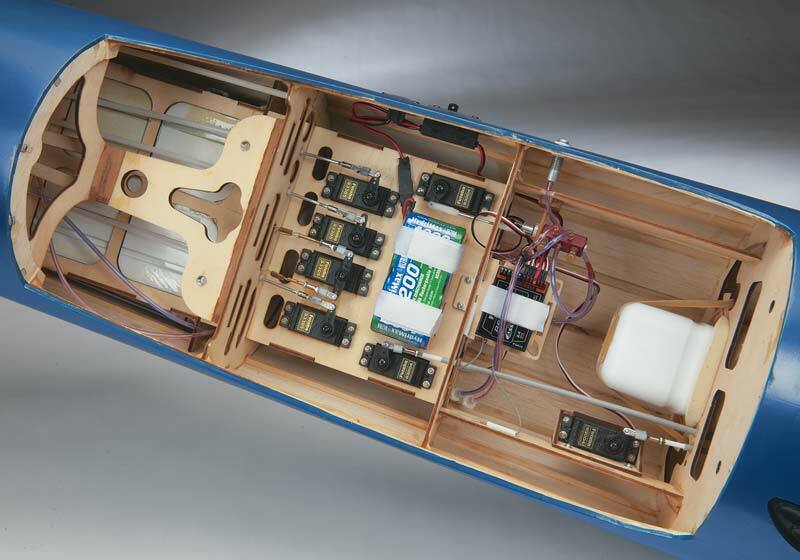 The great advantage of using this idea is that the heavy lipos are placed as far forward as possible, to assist in balancing and are easily accessible for replacement. The view to the right is a side view. ( The "floor" would be on the left hand side of the drawing) Sorry for the confusion! This view shows the front elevation. You can see that the lipos and the ESC are all mounted, using velcro or cable ties, to the motor mounting bracket. 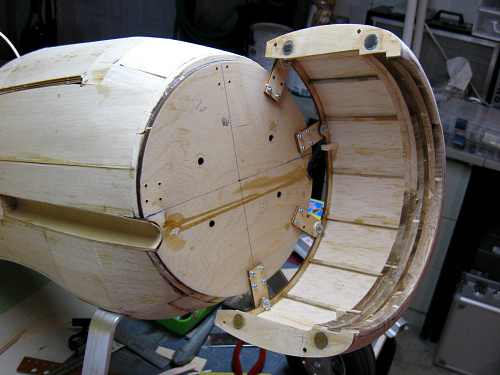 Here you can see the permanent part of the cowl, that is mounted to the firewall. The rare earth magnets can be see, embedded in the ply split plate. Each magnet exerts a pull of 11 lbs, so the cowl is held on with a force of 44 lbs! Here is the removable half in position. There were just a few reviews found-surprising for a model that has been around for a while! Those I did find were all positive and very few negative points were mentioned. One chap removed the Monokote covering and fiberglassed the whole model! Fish looks great, but the weight did increase, but still seems to fly well.